Over the weekend we (the Hubs and I) were able to wrap up a few things. One of those thing was our son's headboard. 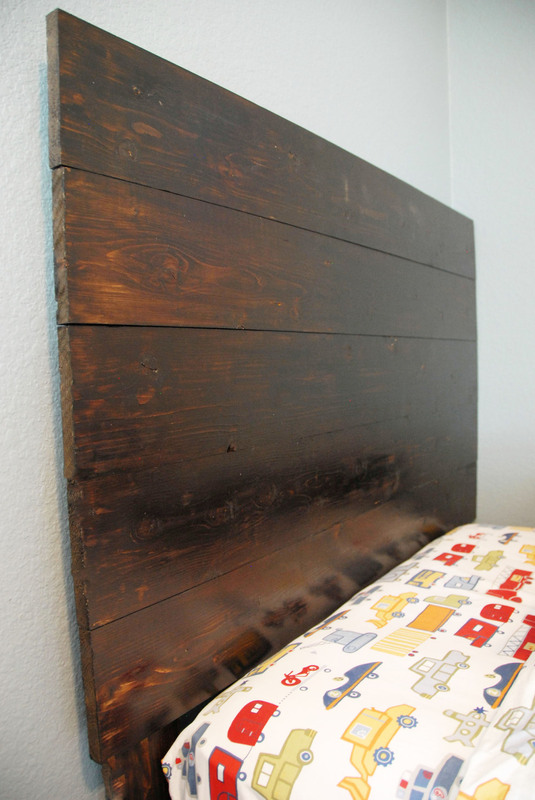 Since we are doing a train theme in his room we thought it would be cool to do a DIY Headboard that looked like old train rails. After a bit of online browsing I found the design I wanted. I sketched out a few plans and headed to the hardware store to grab some materials. Cut the boards to the desired length. 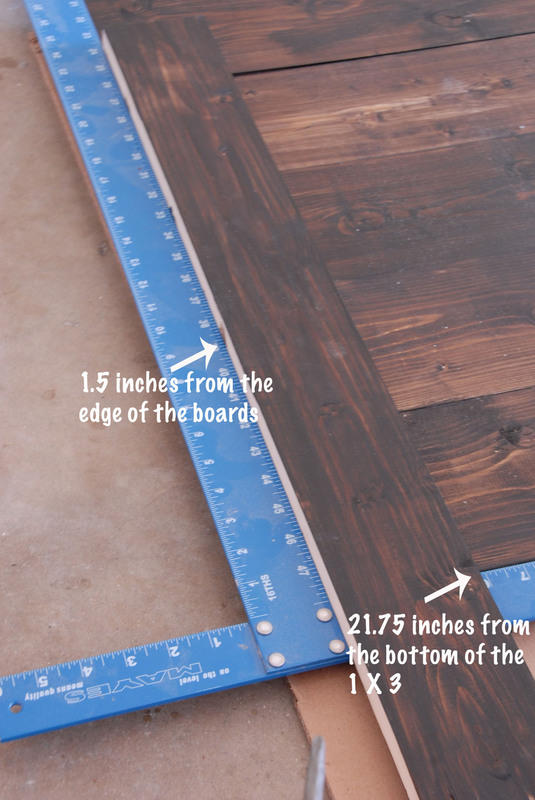 Note: Most lumber yards and home improvement stores will cut boards purchased from their stores to your desired length for free. Sand the wood with a fine grit sandpaper. Remember to always sand with the grain! Note: I suggest using an electric sander and medium grit sandpaper on the edges of the boards to ensure all possible rough edges are smoothed out. Sand the boards with fine grit sandpaper. Remember to sand with the grain. Sand the boards with fine grit sandpaper, going with the grain. Wipe boards with a damp towel to remove any dust. Apply a thin coat of stain, going with the grain. Apply a thin coat of stain, going with the grain, to the boards. 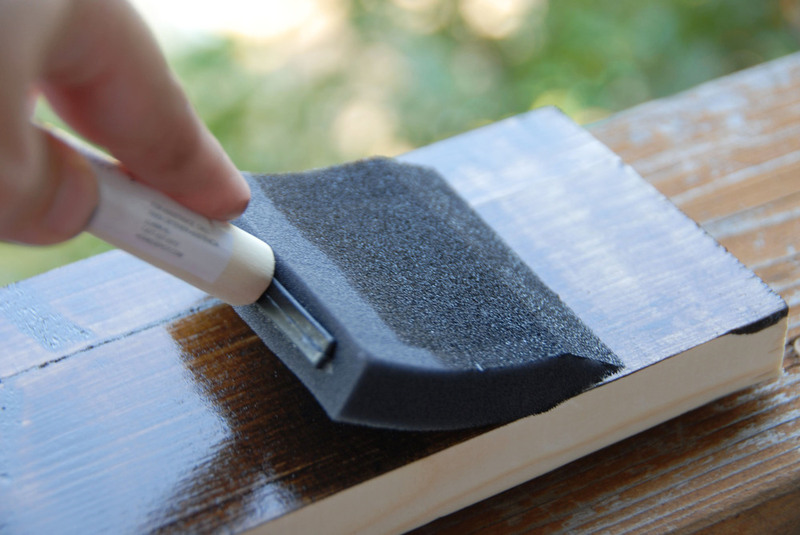 Using a wider sponge, wipe the board from edge to edge (doing this will even out the stain). Note: Do this immediately. If you let the stain sit it will get tacky. 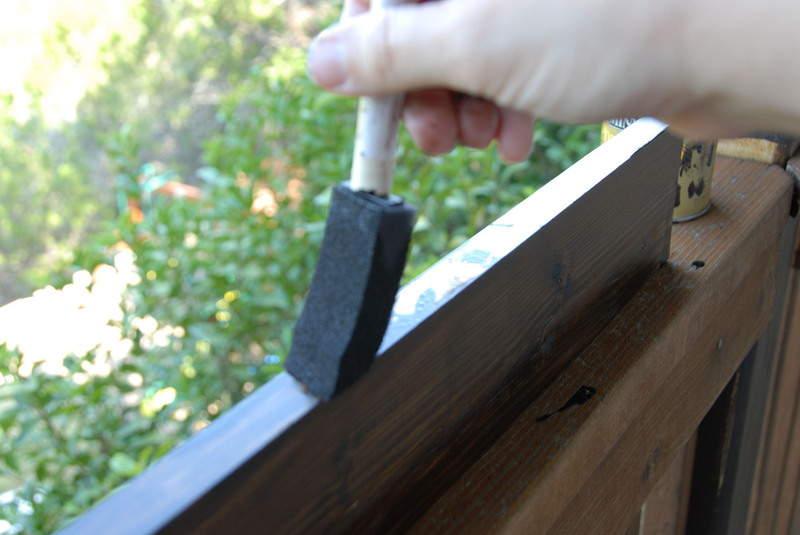 The stain needs to sit for approximately six hours before applying the second coat. If you are like me and want to get as much done as quickly as possible, grab the board by the edges and while holding it, stain the other side of the board. 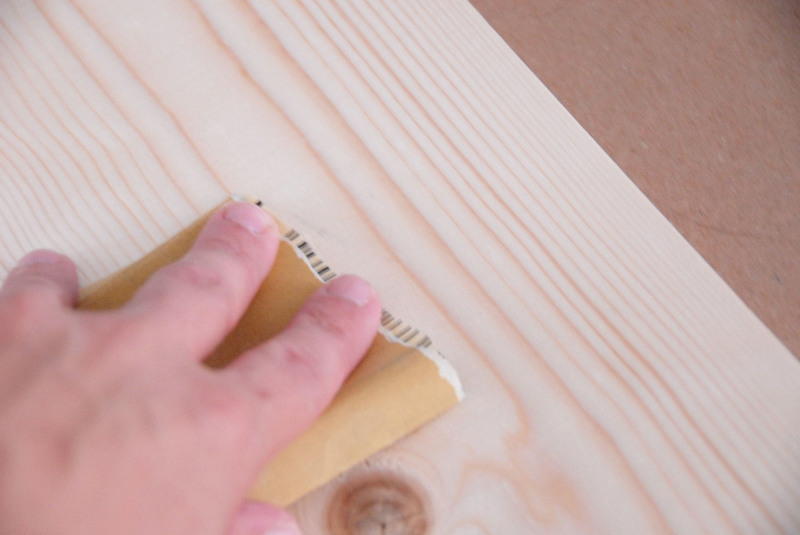 Holding the board on the unstained edges will allow you to stain both sides at on time. Stain the exposed edge of the board. Allow the boards to sit for at least six hours. Trust me on this! I tried a second coat after 4 hours and it turned out terrible! The boards after one thin coat. After the boards have dried, apply the second (and final) coat. Note: At this point, stain the other exposed edge and ends of the boards. Let the boards dry for 6 hours before applying a second coat. Place the 1" X 6" board center behind the left bed rail and mark a hole for drilling. Note: Mark a hole at the highest and lowest slat. Repeat on the right side. Place the 1" X 6" board center behind the left bed rail and mark a hole for drilling. 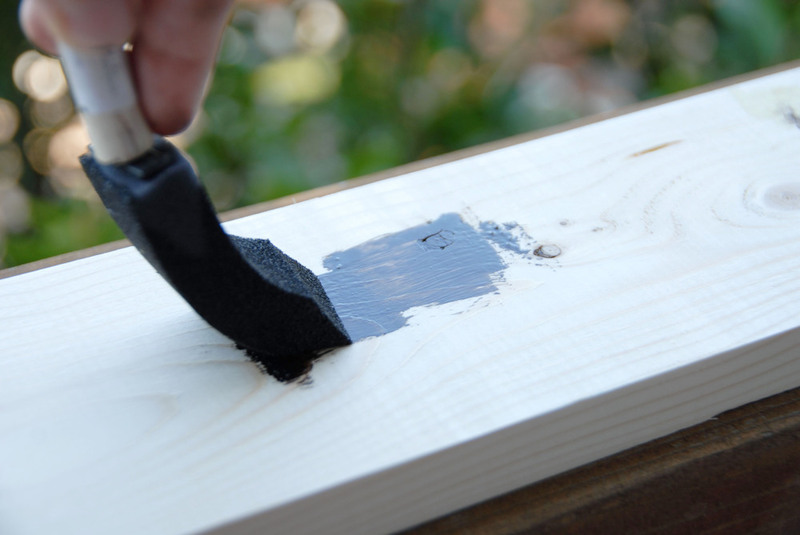 Note: Mark a hole at the highest and lowest slat.Repeat on the right side. 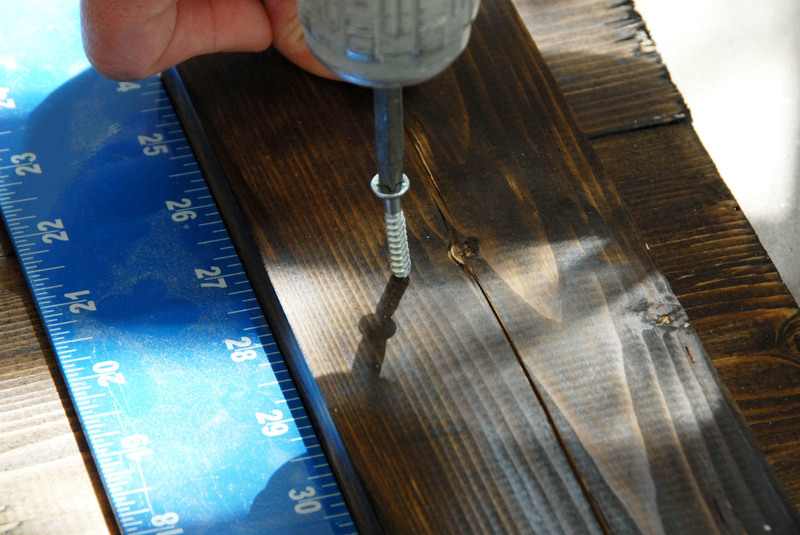 Using a 1/4 inch drill bit, drill at the marked spots on the 1" X 6"s.
Measure 21.75 inches from the bottom of the 1" X 6" and place a mark. This is where the bottom of the first board needs to line-up. Line up all five boards so that they are stacked one on top of the other, front side down. 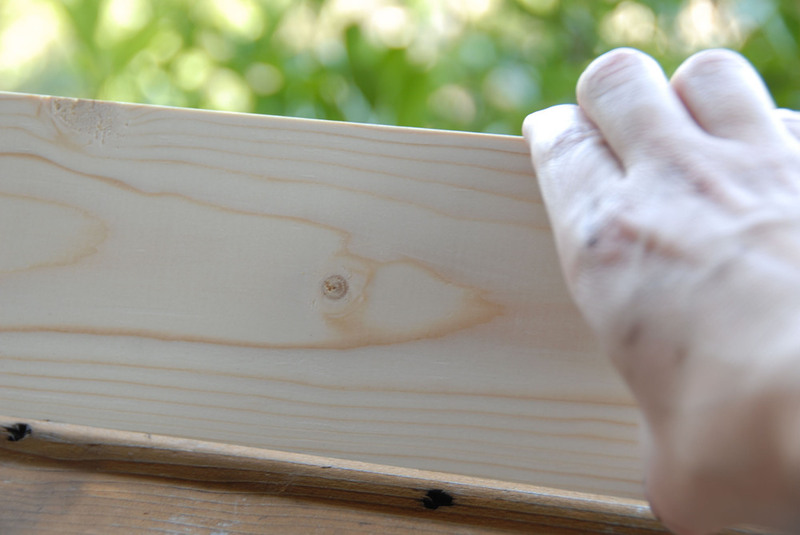 Place the 1" X 6"'s approximately 1.5 inches from the edge of the boards. Note: Use a t-square to ensure the 1" X 6" is straight. Screw one 1 1/4 inch wood screw per slat into the 1" X 6". Repeat on the opposite side. Note: I used screws that did not require pre-drilling. If you do not use this type, you will need to drill a hole using a 3/16th drill bit. Screw one 1 1/4 inch wood screw per slat into the 1" X 6". Repeat on the opposite side. Attached the headboard to the slats in the frame using carriage bolts and washers. 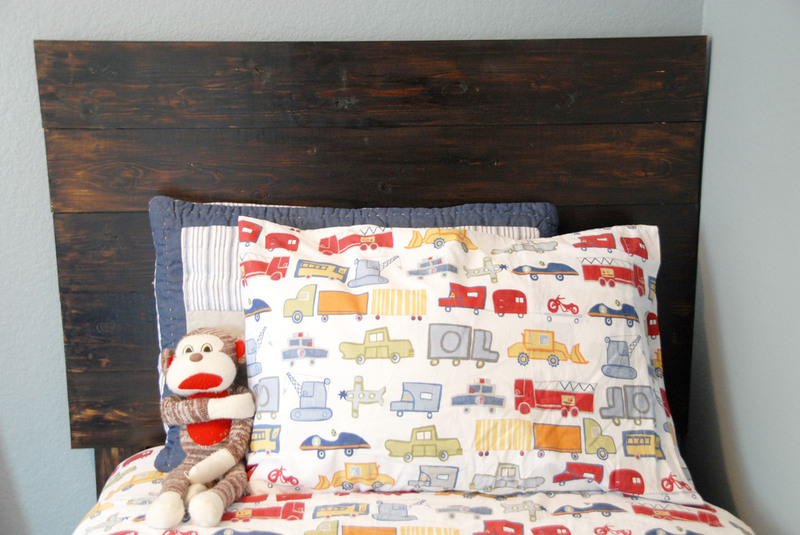 DIY Rustic Headboard SideNot only is this an easy project, but it is also incredibly budget-friendly. Check this out at the Remodelaholic link party!